Deciding which is the best juicer for you is an important first step in getting healthy...and staying healthy. Once you have decided to start juicing, the next step of selecting a juicer can be very frustrating. There are hundreds of juicers that claim all sorts of benefits at all different price levels. You can spend $40 - $50 up to $2600. It took me awhile to find the optimum juicer that would work best for me and make sense price wise. I have used a variety of juicers over the last 15 years that have played a major role in returning to a healthy life. The first juicer was a centrifugal type. A centrifugal juicer has a blade that spins at high speeds and a sieve that allows the juice to separate from the pulp. The pulp is sliced into a fine mash that makes the extraction possible. One of the limitations of this type is you will have to stop and clean the sieve when too much pulp clogs the holes and doesn't allow the juice to flow out properly. Some models eject the pulp which is well worth paying a little more. It is difficult, if not impossible, to juice leafy greens in most centrifugal juicers. These juicers spin at a very high rpm and inject a lot of air into the juice that causes a loss of nutrients and enzymes. It is best to consume juice from these juicers as soon as possible to limit the continued loss of nutrients. Be careful to read the warranty. Some centrifugal juicers have only a 60 day warranty. Centrifugal juicers are half the cost or less than other types of juicers. If you are not sure that juicing is for you in the long term, then the less expensive centrifugal juicer may be the best juicer for you. A masticating juicer tears apart or crushes the vegetable rather than cutting as done with the centrifugal type. The crushing action usually gets more juice out of the pulp. Since this is basically a chewing action, the cells are broken down that result in more enzymes, trace minerals, phytonutrients, and vitamins. These juicers have two phases. The first phase makes the pulp. The second phase squeezes the juice from the pulp. The pulp in a masticating juicer is ejected and is not stored in the machine. Cleaning is usually much easier than a centrifugal juicer. In searching for the best juicer, the quality and the quantity of the juice, in my opinion, is at the top of the list. The masticating juicer is far superior to the centrifugal type. Tests show that the available enzymes remaining after juicing with a masticating juicer are almost twice that of a centrifugal machine. In addition to this, many of these machines also juice leafy greens effectively. Masticating juicers operate at a much slower speed than centrifugal types. The lowest speed machine that I have found runs at 40 rpm with others that go up to 1725 rpm. Because of the low operating speed, it is very quiet. This is a real plus! Most of these juicers come with gadgets to make pastas, nut butters, baby food and fruit sorbets. The lower operating speed results in a higher quality of juice, and warranties run 10 to 15 years...the best in the industry. My Juicing History...experience is the best teacher! My first juicer was a centrifugal type. It was a good quality juicer and I still have it. I thought I had bought the best juicer for the money. The main problem is cleaning since there was no pulp ejection. I also didn't know then that the juice was not as high quality as that of a masticating type. When I started on The Hallelujah Diet to reverse my cancer, I realized that juicing was going to play a key role in regaining my health. So, this started my search for the best juicer I could find for the money. I bought a Champion juicer, which was recommended by the diet protocol. I used this great masticating juicer for 8 years and made 2 to 3 quarts of juice every day. The Champion juicers turn 1725 rpm. I still have this reliable juicer and loan it to people in our classes that need help in getting started. As you study this vast field of information of plant based diets, one tends to fine tune methods to find the most efficient and economical approach to getting healthy...which includes a search for the best juicer. My second masticating juicer was an "Omega". This new type of juicer turned at 80 rpm and was capable of juicing leaf greens. I had a few mechanical problems but overall it did a good job. My current and final juicer is the Samson masticating juicer. This unit also turns at 80 rpm and efficiently juices leaf greens. I find that the quality of the juice is better than all previous juicers. Refrigerated juice will keep for 3 - 5 days in well-sealed 8 ounce Mason jars without significant nutrient loss. 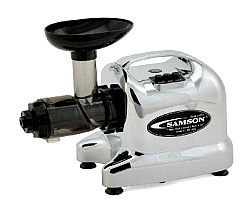 The Samson juicer has an adjustable pressure nozzle that is used for different types of vegetables to obtain the best possible juice. It has a 15 year warranty and is very easy to assemble and clean. You can make fruit ice cream, nut butters, nut milk and pastas. This juicer does everything that I want and gives excellent results for the long term. We have discussed the merits of the centrifugal and masticating juicers. If you are committed to juicing for the long run and looking for the best masticating juicer, I suggest that you seriously consider the Samson juicer which is a machine that has a solid warranty and produces exceptional juice. Click here for pricing and shipping!